People told me this book was disturbing. They didn’t tell me how disturbing. There’s a quote from Paula Stokes that goes, “When you care about someone, you can’t just turn that off because you learn that they betrayed you.” That is exactly the feeling I get when I read this book. I can’t even begin to explain the madness that is this story and the goodness in the evil of the characters, especially in the villains. Shepherd created this story with some pretty amazing and complex characters, and that is just the first of the things she should be commended for. One of the biggest conflicts in this story is the self-conflict that Juliet feels as well as the conflict she feels with the people around her. This book has a fairly small cast (bordering on medium) that Juliet is constantly questioning at one point or another. That makes it sound like a bad thing, but I didn’t think it was. None of the characters of THE MADMAN’S DAUGHTER, including Juliet, are goody-goodies who are completely for or completely against what Dr. Moreau and Juliet started. 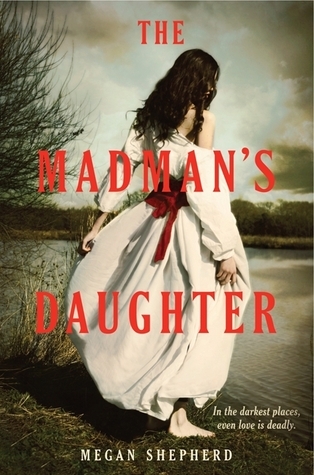 All of the characters in THE MADMAN’S DAUGHTER are strong in one way or another. (Speaking of characters, I would’ve loved to see more of Lucy and Adam). Juliet is bold and brave, a very strong heroine without having to prove anything about herself–refreshing after books that point out time and time again how the heroine doesn’t need anyone and is strong all on her own. She’s not someone who is really cute in any sense. She’s not busy focusing on herself, but more of others, in her own way. She has her own insecurities as well as strengths. And she’s got a brain, by the way, and she uses it. It’s not one she just talks about. Like I said, refreshing. I won’t say I was entirely okay with Montgomery or Juliet’s father or even Edward. They all have their own flaws, just like Juliet does. Montgomery is trapped in this eternal cycle of worshipping Juliet’s father while still knowing at heart that what he’s doing is wrong. Juliet’s father is delusional and utterly insane, but he’s still Juliet’s father. Edward… I don’t even know where to begin with Edward. For most of the story, I was set against him, but Shepherd completely messed that up too (in the last 50 pages of the book, no less). I was just as confused as Juliet about each of these characters, which I’ll say was a pretty impressive move. I hated some of Juliet’s reactions to how the people around her acted, but I could understand her at the same time. There are lots of questions about morality, abnormality, madness, and how far is too far to go under the pretenses of science. Shepherd addresses all of these taboo topics skillfully, in a way that the reader can see just how multi-dimensional these ideas are. It’s not hard to understand the different dissection parts and there’s not a lot of vocabulary to learn over the course of the story. For those of you who are wondering which book the quote is from, that’s from her upcoming book (that I read and think is fantastic) Liars, Inc. Add it to your TBR! Let’s talk characters. Juliet. Edward. Cymbeline. I can blame school Shakespeare studies for my recognition of these names. The very first thing I think of when I hear the name Juliet is Romeo & Juliet, a story that I think is massively overrated–but that’s for another time. Find out about the No Fear, Shakespeare SparkNotes series and The Oregon Shakespeare Festival. As soon as I saw the groupings of names, I figured something was up. I can understand slipping in a few references, but there was way too many characters for it to be just a simple admiration of Shakespeare. This book and the gruesome secrets behind what Dr. Moreau has done–closer to the main characters of THE MADMAN’S DAUGHTER than I ever thought in the beginning–were something I never saw coming. Fans of THE MONSTUMOLOGIST by Rick Yancey or anyone who thinks Virals by Kathy Reichs meets the “pursuit of science” would be interesting to see, this book is for you. I would strongly caution animal lovers or animal (even human) rights activists against reading this book. THE MADMAN’S DAUGHTER…. I really would not agree with everything that is in this book. I don’t mean that I disliked parts of it (I actually did dislike the romance. All of it.) but what I mean to say is that there are so many controversial topics in this book that it’s hard for me to have a strong opinion. One thing I can say–I do believe this book is one of those truly fearless books. I do think it’s very well-written. There’s amazing descriptions and prose. The horror is horrifying without being too scary. The topics are covered in a way that doesn’t cover up anything, but instead shows all the complexity to these issues. All in all, I would recommend this book. 9 out of 10 times, I most likely would not recommend this book to anyone under the age of 15/16. Of course, there are exceptions to that–but this book is graphic at times and kind of creepy at others. For the right person, this book is brilliant in many aspects. I totally did not expect the ending and I can’t wait for the next book. 4.3 stars.